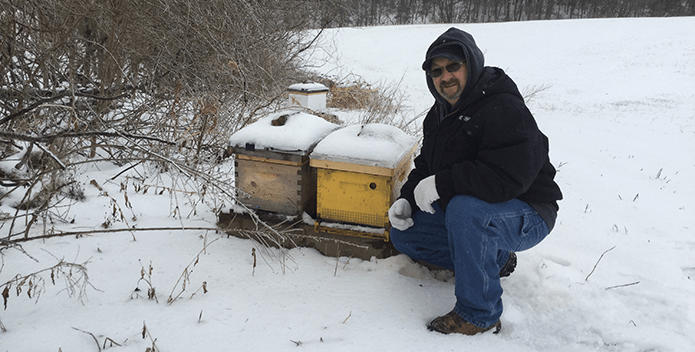 Dave Graybill shows off the beehives on his property. 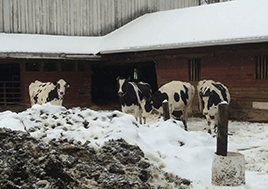 What are farmers doing as winter turns to spring? Good question, with as many answers as there are types of farms in the Chesapeake watershed. If they have livestock, they've been busy taking care of their animals, while on their cropland they have protecting the soil from winter weather and planning for spring planting. Recently CBF's Pennsylvania Agriculture Program Manager, Bill Chain, spent a morning with Dave Graybill, who with his wife, Marie, operate Red Sunset Farm in Juniata County's Mifflintown. They met first at a local café, where other regulars peppered Dave over coffee with questions about his big field of sunflowers ("They form a great cover crop, with deep taproots to hold the soil") and his buckwheat ("Another great cover crop, but they're really there to feed the turkeys"). "Conservation practices just spill out of him," Bill Chain remarked. Dave sits on CBF's PA Farmer Advisory Council, which Bill says helps him understand "the farm side" of conservation practices. He's also a state board officer for the PA Farm Bureau, chairing its Natural and Environmental Resources Committee, and he sits on an environmental regulations advisory committee of the American Farm Bureau Federation, which brings him to Washington, DC periodically. Dave and Bill sat together on the PA's agriculture workgroup committee to establish the Commonwealth's first Watershed Implementation Plan, and they serve together on the Chesapeake Bay Program's agriculture workgroup. Suffice it to say that Dave knows well the value of collaboration between local, state, and federal conservation programs. Schweyer Creek flows to the Juniata River, a major Susquehanna River tributary. Red Sunset Farm encompasses 400 acres of rolling land on a ridge, with one side draining to Squire Run and the other to Lost Creek, both flowing to the Juniata River, a major Susquehanna River tributary. The Graybills milk 60 registered Holsteins and care for 70 replacement heifers, while farming 100 acres of corn, 100 acres of soybeans, 70 acres of hay, some small grains, those 20 acres of sunflowers and buckwheat (the Graybills sell some of the seeds), a pollinator patch, and two dozen beehives (whose bees also love the sunflowers and buckwheat). The rest of the land is carefully-managed pasture. Dave has organized it into a flash-grazing system, with 33 paddocks of 1-3 acres. All are permanently fenced, with the herd visiting each for a day, in between milkings. Then that paddock lies fallow for a month or so for its grasses to recover. In winter and early spring, organizing the rotation is a challenge, especially in cold, snowy, and wet winter. Dave is sensitive to cow safety, especially concerned with having them slip on ice in the ridge-and-valley part of central Pennsylvania, where spring comes late. He chooses carefully which paddocks the cows visit in these conditions: level, high, dry parcels where they can get exercise but not graze down too far when growth is slow and they could damage the soil. For flexibility, he has set up an indoor site with "pen-pack" bedding (corn fodder) for feeding when the weather is especially bad. "What special care do your animals need?" Bill asked. "I want to put them on the best paddocks for the season. I check their hooves and trim them at least every four months," Dave replied. "In the pasture system, I have to check the fences for electrical shorts that stop the current, which the cows seem to be able to sense faster than I can," he said with a wry chuckle. "On sketchy days, I'll let a few out at a time to see how they do. I want to prevent stampede to a broken fence. Loose animals can ruin your whole day." Heifers eat hay outside of Dave Graybill's barn. 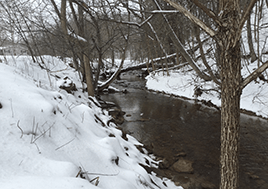 Caring for land in the winter is all about preparation, making good plans. Dave works in his office to evaluate past yields and plan crop nutrient management. For the pastures, he looks carefully at soil composition and the nutrition content in the grasses, before consulting with his veterinarian and nutritionist on diets for his cows. He plans for 40 crop contour strips, to fit specific fields' terrains & microclimate, since he farms on both sides of the ridge. He sets up a crop rotation plan, partly in the office and partly by walking fields to assess density of plants and decide whether to plant alternative crops. As the weather warms slightly now, he spreads some cover crops on wheat, rye, and barley fields, with clovers growing underneath, so when he harvests July, the clover cover crop will protect the soil. Dave plants the cover crop with a spinner behind a tractor. It requires careful management, looking especially to plant on "honey-combed" frozen soil with open spots where the tiny seeds can land and germinate. Timing is critical, especially with micro-conditions on specific fields on either side of ridge. It's also critical for application of both liquid and solid (pen-pack) manure, only "when the ground is ready to take it." That's a matter of judging soil moisture, temperature, soil texture (he doesn't want to cut trenches, compact the soil, or damage its biota), and proximity to planting season, when growing plants can use the manure's nutrients. "What are your opportunities for to practice conservation in the winter and early spring?" Bill asked. 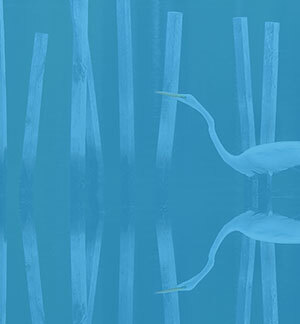 "It's all about timing," Dave replied, "watching the fields closely with experienced practiced eyes. I walk a lot, watch the season change day by day. I take a lot of pride in the condition of the paddocks. Because timing of fermentation drives nutrition content, regular plant tissue tests of corn silage help us balance rations for the cows, and they drive decisions about which hybrid strains to plant in the new year. "Every day we love what we're doing, being responsible for all of these animals and all of these acres," Dave says. "I look at it this way: I have 60 cows and 60 heifers that I take good care of and a couple hundred thousand bees. It's all about management: planning for contour strips, timing for cover crops, making sure cows are content and safe. We aim to keep cow health, production, and conservation all progressing together." Yes, it's farmers like Dave and Marie Graybill that keep us optimistic that we can restore the health of the Susquehanna and the Chesapeake. More power to them!